Yohannes IV (ትግርኛ: ዮሐንስ ፬ይ, Āratenya Yōḥānnis; horse name "Abba Bezba"; 11 July 1837 – 10 March 1889), born Lij Kahśa Mercha and contemporaneously also known in English as Johannes or John IV, was ruler of Tigray 1867–71, and Emperor of Ethiopia ("King of Zion" and "King of Kings" of Ethiopia [as shown in his seal]) 1872–89. He is remembered as one of the leading architects of the modern state of Ethiopia. On the side of his father, Mercha Wolde Kidan, Yohannes descended from the ruling dynasty of Tembien where both his father and grandfather bore the traditional title of šum Tembien, while his mother, Silass Dimtsu, was a daughter of balgäda Demsu of Enderta and Tabotu Woldu of Agame, hence a niece of Sabagadis Woldu. He thus descended from the ruling families of Tembien, Agame, and Enderta. He also had connubial connections with some notables who came to his aid in the early stages: his cousin, Amlasu Araya Selassie, married ras Alula Engida who remained loyal to Yohannes throughout his life, another cousin Altash Wahad married ras Wolde Mikael Solomon who fought on his side in the second half of the 1860s, though later he became his opponent. His sister, Dinqnesh, was married first to Gobez (later atse Tekle Giyorgis) who supported his rebellion against atse Tewodros II in the late 1860s and later to ras bitwädäd Gebre Kidan, one of the leading supporters of Yohannes. His chroniclers further remotely connect him genealogically to the branches of the Solomonic dynasty in Gondar and Shewa. All these relationships contributed toward Yohannes's rise to power in the 1860s and 70s. The story of the first half of his life is poorly documented. Even the date of his birth is uncertain; various sources place it between 1831 and 1837. The available sources merely indicate that he was the youngest of his siblings, that he had a seriously ailing childhood, that he received some church education, and that he was initiated to manhood after killing some wild animals (lions and/or elephants) for trophies. 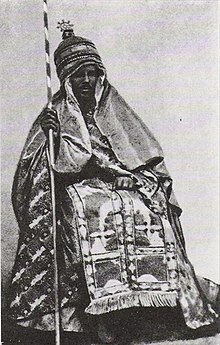 The first mention of his appearance in the political arena comes up in connection with his visit to the imperial court of Tewodros in 1864-65 in the company of his brothers, Gugsa and Maru. Gugsa was given the title of däjazmač, and Maru that of fit’awrari. The lowest title, of balambaras, was bestowed upon Kaśa, who was subsequently assigned to administer a sub-district within the governorship of his elder brother, Gugsa. Shortly after their return to Tigray, Kaśa rebelled against the rule of Tewodros. What prompted his rebellion is not well established. Often two explanations, which are not essentially contradictory, are forwarded by the sources: the first is related to his dissatisfaction with the rank and function given to him by the sovereign, while the second interprets his rebellion as a response to the appeal of abunä Salama who in 1867 wrote from prison to many notables condemning the injustices of Tewodros. In any case, for some time his (together with his followers) retired to the eastern lowlands and found refuge among the Afar, from which ethnic group he married a Muslim after she had been baptized with the name Tebaba Sellasie. Reurning to the highlands, he raised more men and began his military campaign: in the years 1864-67, he consecutively defeated šum serye Gebre Mikael, däjazmač Barya'u Gebre Sadeq of Adwa and däjazmač Tekle Giyorgis Qalos of Shire. Barya'u transferred his allegiance to Kaśa whom he served faithfully until he was killed in a battle some ten years later. Tekle Giyorgis (who had killed Kaśa's mother, Silass) fell in battle, and Kaśa subsequently assumed his title of däjazmač. 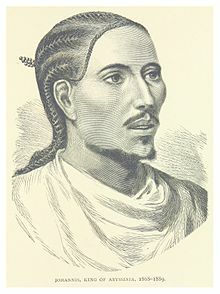 Kaśa then formed an alliance with wag šum Gobez Gebre Medhin of Lasta against Tewodros and began to harass the imperial representatives on both side of the Mareb. He defeated the governors of Selewa and Kilte Awulaelo. In Hamasien, däjazmač Haylu Tewolde Medhen, who contemplated resistance, was confined and replaced with däjazmač (later ras) Wolde Mikael Solomon who had actively participated in Kaśa's military campaign against the imperial officials in Tigray. By the time the British Napier expedition against Tewodros arrived in the region, Kaśa had attained full control of most of the then province of Tigray as well as of the Christian highlands of Eritrea. He had even begun to conquer the regions west of the Tekezé including Tselemt, Wolqayt, Tsegede and parts of Semien. Thus, the British needed his permission to cross his territory and reach Maqdala. Kaśa allowed them free passage as well as the privilege to purchase provisions from the local markets on condition that they left the country immediately after the mission. Upon their return from the Maqdala expedition, the British expressed their gratitude by giving him weapons for a present: "a battery of mountain guns and mortars and sufficient smooth-bore muskets for one regiment". Following the death of Tewodros, his brother-in-law Gobeze Gebre Medhin had himself crowned as nəgusä nägäst Tekle Giyorgis II. He successfully suppressed rebellions of ras Wolde Maryam of Begemender and Fares Ali of Yejju, and reached a peace agreement with Menelik of Shewa (future atse Menelik II). Kaśa, however, refused to acknowledge the new metropolitan abunä Atnatyos sent from Alexandria in June 1869, and kept him in his dominion. Finally, on 11 July 1871, Tekle Giyorgis confronted Kaśa in a battle in the vicinity of Adwa (battle of Assem), but was defeated and confined to Enda Abba Selama, Tembien, where he would die two years later. Upon vanquishing the rebellions of Wolde Iyasus in Azebo and Kaśa Golja on the northern peripheries, on 21 January 1872 Yohannes was crowned in Aksum as Yohannes IV by abunä Atnatyos (becoming the first emperor crowned in Axum since Fasilides in 1632). 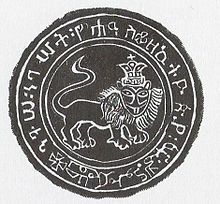 His seal also changed from "...nəgusä mäkanənt" ('head of the notables') to "...nəgusä Səyon, nəgusä nəguśt zä Ityopya" ('King of Zion, King of Kings of Ethiopia'). The principle of Yohannes's internal policy was to unite and aggrandize Ethiopia, a traditional ideal which had been revived by Tewodros II after almost a century of dissension and decline. To insure the realization of this policy, he toured each region and appointed governors, usually from the local nobility, regardless of their former attitudes toward him, as long as they submitted and expressed to him their unflinching loyalty. He thus managed, as the contemporary English vice-consul put it, "to hold the scales of justice with a firm and even hand"; "it was in 1884 the boast of King Johannes that a child could pass through his dominions unharmed". In the first six years of his reign, he succeeded in achieving the unity of the predominantly Christian provinces, including Wag and Lasta, Semien and Begemder, Sayint, Gojjam, Wollo and Shewa. He crowned Menelik King of Shewa in 1878 and Tekle Haymanot King of Gojjam and Kaffa in 1881 and encouraged them to expand their empire to the south, east, and west. However, this advice created rivalry between the two regional kings, which came to a climax in the Battle of Embabo in June 1882. Yohannes reprimanded both of them for fighting without his permission, punished them by taking away a province from the jurisdiction of each of them and defined the direction of territories to be conquered by each of the two kinds. In the first ten years Yohannes had no fixed capital for his empire. He camped for about two and half months in Aksum at the time of his coronation, but there is no indication that he would make it the imperial capital. It seems that he intended to revive the tradition of a mobile capital of medieval Ethiopia. There were, nonetheless, three centers which he frequented: Adwa where he usually celebrated Meskel, Amba Chara and Semera, both of which were located in Begemder. In the early 1880s, however, he chose Mek'ele as his center where he had a palace erected by an Italian craftsman, Giacomo Naretti. Yohannes inherited the empire encumbered with three religious questions which provoked him to seek a solution: the internal dissensions of the Ethiopian Orthodox Tewahedo Church (EOC), the threat of Islam to the state and Christianity, and foreign missionary activities. He regarded all of them as menaces to the unity and stability of the state. By 1878, Yohannes was ready to tackle the problems by summoning a council at Boru Meda, Wollo. Most of the high dignitaries and notables of Ethiopia were present at the council. The leading theologians of the three major disputing groups of the EOC — Karra (predominant in the north), Sägga or Śost Lədät (prevalent in Begemeder and Shewa) and Qəbat (based in Gojjam and Lasta) — tried to defend their respective doctrines. Yohannes readily accepted corrections made by a notable on procedural mattes. Apparently, he had a long-prepared plan for the council, as he had a letter from the patriarch of Alexandria read out at the end of the disputation which endorsed the imperial tenet. The policy transcended Yohannes's reign, through there were indications that the suppressed tenets had by no means been eradicated. Throughout his reign, Yohannes was embroiled in military struggles on his northern frontiers. First was from Khedive Isma'il Pasha of Egypt, who sought to bring the entire Nile River basin under his rule. The Egyptians flirted with encouraging Menelik of Shewa against the Emperor, but earned Menelik's enmity by marching from the port of Zeila and occupying the city-state of Harar on 11 October 1875. Both Menelik and Yohannes had regarded Harar as a renegade province of Ethiopia, and Egyptian seizure of the Emirate was not welcome to either of them. The Egyptians then marched into northern Ethiopia from their coastal possessions around the port of Massawa. Yohannes pleaded with the British to stop their Egyptian allies and even withdrew from his own territory in order to show the Europeans that he was the wronged party and that the Khedive was the aggressor. However, Yohannes soon realized that the Europeans would not stop the Khedive of Egypt and so he gathered up his armies and marched to meet the Egyptian force. The two armies met at Gundat (also called Guda-gude) on the morning of 16 November 1875. The Egyptians were tricked into marching into a narrow and steep valley and were wiped out by Ethiopian gunners surrounding the valley from the surrounding mountains. Virtually the entire Egyptian force, along with its many officers of European and North American background, were killed. News of this huge defeat was suppressed in Egypt for fear that it would undermine the government of the Khedive. A new Egyptian force was assembled and sent to avenge the defeat at Gundat. The Egyptians were defeated again at the Battle of Gura (7–9 March 1876), where the Ethiopians were led again by the Emperor, and his loyal general, the capable (and future Ras) Alula Engida. This victory was followed by Menelik's submission to Yohannes on 20 March 1878, and in return, Yohannes recognized Menelik's hereditary right to the title of King (Negus) of Shewa, and re-crowned him on 26 March. Yohannes took this opportunity to tie the Shewan King more closely to him by arranging for Menelik's daughter Zewditu (the future Empress of Ethiopia in her own right), to be married to his own son and heir, Ras Araya Selassie. Emperor Yohannes also convened a general council of the Ethiopian Church at Boru Meda later in 1878, which brought an end to the ongoing theological dispute in the local church; Christians, Muslims, and pagans were given respectively two, three and five years to conform to the council's decisions. Non-Christians were forbidden from participating in the government unless they converted and were baptized; the Muslims were given three months, while the pagans had to become Christians immediately. "Having concluded that Wollo was worth a mass," as Harold Marcus wryly puts it, his retainer Ras Mohammed of Wollo became disobedient of the tax rules, which he and the entire Wollo refused to pay tax to the government in which Emperor Yohannes had discovered, Ras Mohammed was conspiring with the Turks the Ottoman empire because of his Muslim affiliation. Ras Mohammed was brought to Emperor Yohannes and was confronted of his conspiracy in helping the Muslim colonizer and to bring down the Judeo Christian empire. Ras Mohammed was siding with Muslim Affiliates of Turkey. 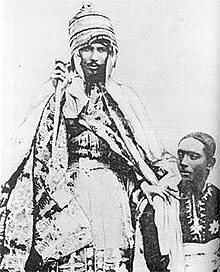 After meeting with King Yohannes and in learning that if he were to assist the Turks, in the end, he and the rest of Ethiopia would become a slave to the Arab/Muslim world. Ras Mohammed then chose to become a Christian to later inherit a Christian name (later Negus) Mikael of Wollo, the Emperor stood as his godfather at his baptism. The new convert was given Menelik of Shewa's other daughter, Shewarega Menelik, as his wife. Yohannes went one step further and pressured Menelik to expel all of the Roman Catholic missionaries from Shewa. However this time, instead of a single Archbishop, he requested that Patriarch Cyril send four to serve the large number of Christians in Ethiopia, who arrived in 1881. They were led by Abuna Petros as Archbishop, Abuna Matewos for Shewa, Abuna Luqas for Gojjam and Abuna Markos for Gondar. Abuna Markos died shortly after arriving, so his diocese was included with that of Abuna Atnatewos. It was the first time that the Coptic Patriarch of Alexandria had appointed four Bishops for Ethiopia. Portrait Ras Alula Engida, Grand General of Yohannes IV, participated in the war against Egypt, Italy and the Mahdist. When Muhammad Ahmad proclaimed himself the Mahdi, and incited Sudan into a long and violent revolt, his followers successfully either drove the Egyptian garrisons out of Sudan or isolated them at Suakin and at various posts in the south. Yohannes agreed to British requests to allow these Egyptian soldiers to evacuate through his lands, with the understanding that the British Empire would then support his claims on important ports like Massawa on the Red Sea to import weapons and ammunition, in the event that Egypt was forced to withdraw from them. This was formalized in a treaty signed with the British at Adwa known as the Hewett Treaty. The immediate result was that the wrath of the Mahdiyah fell upon Ethiopia: Ras Alula defeated an invading Mahdist army at the Battle of Kufit on 23 September 1885. About the same time, Italy took control of the port of Massawa, frustrating Ethiopian hopes and angering Yohannes. Yohannes attempted to work out some kind of understanding with the Italians, so he could turn his attention to the more pressing problem of the Mahdists, although Ras Alula took it upon himself to attack Italian units that were on both sides of the ill-defined frontier between the two powers. Domestic problems increased when the Neguses of both Gojjam and Shewa rebelled against Yohannes, and the Emperor had to turn his attention from the encroaching Italians to deal with his rebellious vassals. Yohannes brutally crushed the Gojjame rebellion, but before he could turn his attention to Shewa news arrived that the Mahdist forces had sacked Gondar and burned its holy churches. He marched north from Gojjam to confront the armies of the Mahdi. Winner of Egypt and Neguse Negest Empire undisputed, Yohannes IV, in 1878, is at the peak of his reign. Registration Amharic remembering the call to arms to Yohannes IV. Evidence suggests that Emperor Yohannes had acted rashly and had made himself vulnerable, going beyond enemy lines in a range of enemy shots as victory was going to his side. Mortally wounded from a gunshot, he had been carried to his tent, where he announced that his nephew Ras Mengesha was actually his natural son, and named him his heir (his elder son Ras Araya Selassie had died a few years earlier). He died hours later. Although the Ethiopian army had almost annihilated their opponents in this battle, hearing that their ruler had been slain shattered their morale and allowed the Mahdists to counterattack, scattering the Ethiopian forces. Yohannes's body was carried back to Tigray guarded by a small party, who were overtaken by the Mahdist troops of Zeki Tummal near the Atbara River, who captured the sovereign's body. Augustus B. Wylde, who claimed to have heard the story from a priest who managed to escape the slaughter, wrote how Yohannes' uncle Ras Areya stood beside the body of his dead master with "a few of his soldiers and the bravest of the king's servants, who had lost their all, and had no more prospects to live for". Ras Areya was last seen standing alongside the box containing the king's body, after having expended all his ammunition, with his shield and sword in his hands, defending himself, till at last he was speared by a Dervish from behind, and died fighting gamely like the fine old warrior that he was. According to Wylde, as he saw death come Ras Areya announced "that he was now old and done for, that his time had come, and it was useless at his age to serve another master that he knew little about, and it was better to die like a man fighting unbelievers, than like a mule in a stable." The Mahdists brought the Emperor's body back to their capital at Omdurman, where the head was put on a pike and paraded through the streets. Although a group of Tigrean nobles led by Ras Alula attempted to promote the claim of Ras Mengesha Yohannes (the "natural" son of Yohannes) as Emperor, many of the dead monarch's other relatives on both the Enderta and Tembien sides of his family objected and went into open rebellion against Mengesha. Many refused to accept Ras Mengesha as the son of Yohannes, having long known him as his nephew. Tigray was torn assunder by the rebellions of various members of the Emperor's family against Mengesha and each other. Menelik of Shewa took advantage of Tigrean disorder, and after the Italians occupied Hamasien, (a district Yohannes IV had bestowed upon Ras Alula) he was proclaimed Emperor of Ethiopia as Menelik II. The death of Yohannes reduced the influence of Tigrayans in the Ethiopian government and opened the way for Italians to occupy more districts previously held by Tigrayan nobles. The seizures made by the Italians at this time ultimately resulted in the creation of the colony of Eritrea and the defeat of Italy at the Battle of Adwa at the hands of Emperor Menelik II. The Tigrean nobility retained influence at the Imperial court of Menelik and his successors, although not at the level they enjoyed under Yohannes IV. The descendants of Yohannes ruled Tigray as hereditary Princes until the Ethiopian Revolution and the fall of the monarchy in 1974 ended their rule. There are two lines of descent from Yohannes IV, one "legitimate" and one "natural." The legitimate line is through his elder son, Ras Araya Selassie Yohannes. Araya Selassie Yohannes was born to his wife Wolete Selassie. The son of Araya Selassie Yohannes was Ras Gugsa Araya Selassie. His son was the infamous Dejazmach Haile Selassie Gugsa who governed eastern Tigray in the 1930s and was married to Emperor Haile Selassie's daughter Princess Zenebework Haile Selassie. However, following the death of his wife, Dejazmatch Haile Selassie Gugsa's relationship with Emperor Haile Selassie deteriorated, and in 1936, Dejazmatch Haile Selassie became the first high-ranking Ethiopian nobleman to defect to the Italians when the Fascist forces invaded Ethiopia. The people of Mek'ele ransacked his house when this news was revealed. He was elevated to the title of Ras by the King of Italy. However, following the liberation of Ethiopia in 1941, Haile Selassie Gugsa was placed under house arrest and regarded as a traitor. Emperor Haile Selassie refused to acknowledge the title of Ras granted to his former son-in-law by the King of Italy, and so he reverted to the title of Dejazmatch. He was freed by the Derg regime in 1974 following the fall of the monarchy. He died shortly thereafter. There are other descendants of Emperor Yohannes IV in this "legitimate" line, but because of the wartime actions of Dejazmatch Haile Selassie Gugsa, this branch of the family fell into disfavor at the Imperial court and lost its position and influence. The second, "natural" line is through Ras Mengesha Yohannes and is the better-known line. Although Ras Mengesha Yohannes ended his days under house arrest for his repeated rebelling against Emperor Menelik II. Ras Mengesha's son Ras Seyoum Mengesha first became governor of western Tigray, and following the treason of his cousin Dejazmatch Haile Selassie Gugsa, became Governor (Shum) of all of Tigray in 1936. He commanded troops against the Italians, but was forced to surrender and spent most of the Italian occupation under house arrest in Addis Ababa. Following the return of Emperor Haile Selassie in 1941, Ras Seyoum was restored to his governorate of Tigray, recognized as the hereditary Prince of that province. Ras Seyoum Mengesha was killed during the abortive coup by the Imperial Bodyguard in 1960 and was succeeded by his son Ras Mengesha Seyoum who served as Governor and hereditary Prince of Tigray until the 1974 Revolution toppled the Ethiopian monarchy. Ras Mengesha Seyoum is married to Princess Aida Desta, a granddaughter of Emperor Haile Selassie and is the current head of the Tigrean branch of the Solomonic dynasty. Mengesha Seyum is the last person alive today who bears the title of Leul Ras. Yohannes undoubtedly had his weakness, but mostly they were not his own making, but imposed on him either by external pressure or inherited by his deep-seated values and traditional norms. During the eighteen years of his reign, he was preoccupied, most of the time, defending his country against external aggressions perpetrated by the Egyptians, the Italians, and the Mahdists. Yohannes succeed to a large extent to pacify the country and to expand the empire by the device of power-sharing and accommodation guiding principle of his administration were patience, tolerance, and forgiveness, as well as a tendency to preserve the status quo. Above all, his concern was focused on promoting peace the external threats rather than promoting his own personal or dynastic gain. The way he shared his authority with Menelik and Tekle Haymanot undoubtedly resulted eventually in undermining his own authority, but it contributed greatly in accelerating the process of reunification of the Ethiopian Empire. By preserving the status quo in the regional administration, the uncertainty and fear, which permeated under previous reigns due to constant changes, were reduced. The self-confidence and charitable attitude, which he displayed toward his vanquished enemies or rivals, earned him the administration and high esteem of his subjects. Early in his career after he defeated and seized Dejazmatch Gabre Mikael of Tsrae, who was responsible for the death of his own mother Woizero Silas Dimtsu, not only did he forgive him, but within a year, Gabre Mikael was reinstated as councilor and appeared as one of the important dignitaries during the mission of Major Grant to Adwa, in February 1868. Subsequently, Gabre Mikael's son, Dejazmach Birru, also held important posts. Ras Adal of Gojjam, after he killed his own cousin, Ras Desta Tedla Guala, the newly appointed governor by Yohannes and submitted to Yohannes and asked for forgiveness, not only was he forgiven but he was given the command over Gojjam and eventually elevated as King of Gojjam and Kefa, under the name of Tekle Haymanot. King Menelik's ambition to seize the imperial crown was clearly evident since his escape from Mäqdalä and return to Shoa, in 1865. The submission of Menelik to Yohannes was not effected until 1878 after Yohannes gained substantial advantage over his rivals in terms of quality and quantity of firearms as a result of the booty gathered in his successive victories over the Egyptian army at Gundet Gurae, in 1875 and 1876, respectively. This advantage remained on Yohannes's side throughout his reign. Despite a repeated pressure from his advisers on two occasions, in 1878, at the time of Menelik's submission and in 1881, after his two vassal kings, Menelik and Teklé Haymanot fought against each other at Embabo, to remove Menelik and replace him if need be, by one of his cousins, such as Meshesha Seifu, Yohannes refused to yield on grounds that he was not going to destroy an effective power, which Menelik diligently built up for the sake of eliminating a possible threat to himself.Finally, Yohannes heard that both his vassal kings have defected and during his campaign in Gojjam, Tekle Haymant confessed that they had concluded an agreement to help one another and rebel against the authority of the Emperor. At this juncture, the temptation was great to cross the Abbay River to Showan territory and eliminate the internal threat. Yohannes's priority, however, was to avert the external threat and he decided to face the Mahdists who had penetrated twice as far as Gonder and burnt the churches, pillaged the country, and enslaved people. Throughout his reign, Yohannes demonstrated selfless devotion to the defense of the territorial integrity of Ethiopian Empire against successive waves of external aggression, by Egyptians, Italians, and Mahdists Sudan. He also strove within the parameters of what was possible in his day to promote the welfare of his people. His devotion to his country and people culminated in the supreme sacrifice of his life at the border of his empire, in the Battle of Metemma. ^ "Index Y". Rulers.org. Retrieved 2 December 2017. ^ a b c d e f g h i j Uhlig, Siegbert (2014). Encyclopaedia Aethiopica. 5: Y-Z. Otto Harrassowitz. p. 73. ^ "Giovanni IV Imperatore d'Etiopia in "Dizionario di Storia"". Treccani.it. Retrieved 2 December 2017. ^ "Yohannes IV - emperor of Ethiopia". Britannica.com. Retrieved 2 December 2017. ^ "Emperor Yohannes IV – Imperial Ethiopia". haileselassie.net. Retrieved 8 January 2017. ^ Prunier, G.; Ficquet, É. (2015). Understanding Contemporary Ethiopia: Monarchy, Revolution and the Legacy of Meles Zenawi. Hurst. ISBN 9781849046183. Retrieved 8 January 2017. ^ "Abyssinia" in the Encyclopædia Britannica, 9th ed., Vol. I, pp. 61–67. 1878. ^ Akyeampong, E.K. ; Gates, H.L. (2012). Dictionary of African Biography. 6. OUP USA. pp. 5–164. ISBN 9780195382075. Retrieved 8 January 2017. ^ Falola, T. (2004). Teen Life in Africa. Greenwood Press. p. 77. ISBN 9780313321948. Retrieved 8 January 2017. ^ Marcus, Harold G. (1995). The Life and Times of Menelik II: Ethiopia 1844–1913. Lawrenceville: Red Sea Press. pp. 57–59. ISBN 1-56902-010-8. ^ Milkias, Paulos (2 December 2017). "Ethiopia". ABC-CLIO. Retrieved 2 December 2017 – via Google Books. ^ Shinn, David H.; Ofcansky, Thomas P. (11 April 2013). "Historical Dictionary of Ethiopia". Scarecrow Press. Retrieved 2 December 2017 – via Google Books. Gabre-Sellassie, Zewde (1975). Yohannes IV of Ethiopia: A Political Biography (1st ed.). Oxford, England: Clarendon Press. Rubenson, Sven (1976). The Survival of Ethiopian Independence. Heinemann Educational Books. Tafla, Bairu. Chronicle of Emperor Yohannes IV (1872-89) (in Geez and English). Henze, Paul B. (2000). "Yohannes IV and Menelik II: The Empire Restored, Expanded, and Defended". Layers of Time: A History of Ethiopia. New York: St. Martin's Press. ISBN 0-312-22719-1. Lewis, David Levering (1987). "Pawns of Pawns". The Race to Fashoda. New York: Olympic Marketing Corp. ISBN 1-55584-058-2.